Recovery Disks can return full access to your computer very quickly and simply, so this means you can have password-less re-entry to your system! You can make a Recovery Disk simply by running the "Recovery Disk Creation Tool" and by inserting a blank Floppy diskette into your computer, then all you need to do is keep your disk in a safe place. 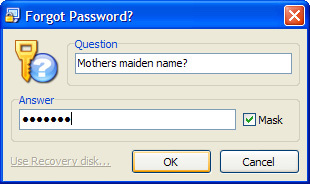 To use the disk you simply insert it into the drive which you created the disk in originally, and click on "Forgot your password?" in the white area on the main screen of Lockit. You are then prompted with the "Forgot password?" screen, on this screen is a label saying "Use Recovery Disk..."